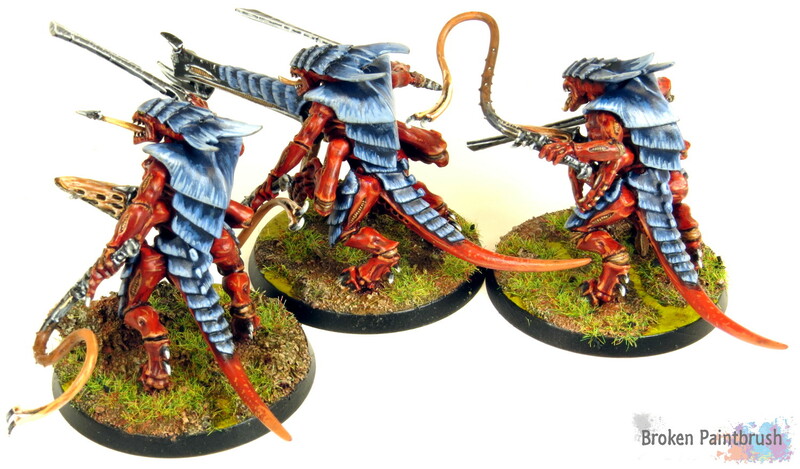 Next up from the Deathstorm box is the three Tyranid Warriors. This is the second Tyranid Warriors brood that I’ve painted, with the first being armed with scything talons and death spitters, I decided to give this squad a venom cannon and devourers for shooting, and bone swords and lash whips for close range. I really like the new Tyranid Warriors kit with all the great weapon options, it was actually a bit difficult to decide on what to go with. I liked the idea of the bone swords for marine killingness and the lash whips give an interesting look as well. The devourers were just because they looked cool and were different from the death spitters in the other squad. I based these just like the Carnifex, using bark to add some rock formations and leaving bare spots on the base for water areas. I think it adds a nice green organic contrast to the alien blue and red. It also helped that the bases used in the Deathstorm box were a bit bigger than the typical based given in the kit. I also took a bunch of in progress picture for these guys with the thought of a step-by-step but am not sure if it would give much more than the Carnifex tutorial, perhaps I’ll get around to editing down the 54 pictures into something meaningful for you all. Like I said, the new kits are a great step up from the old kit, which in itself wasn’t bad, but the expanded weapon options are really nice.